If you have enabled Azure authentication you can use Azure AD groups to deploy and control access to printers based on users’ group membership. You must have the role as global admin in Azure AD to synchronize groups. *Nested groups are not supported. On the Authentication page select the Azure AD tab. Enter your administrator account. You must have the role as global admin in Azure AD to synchronize groups. Sign you in and read user profile. Read all users’ full profiles. 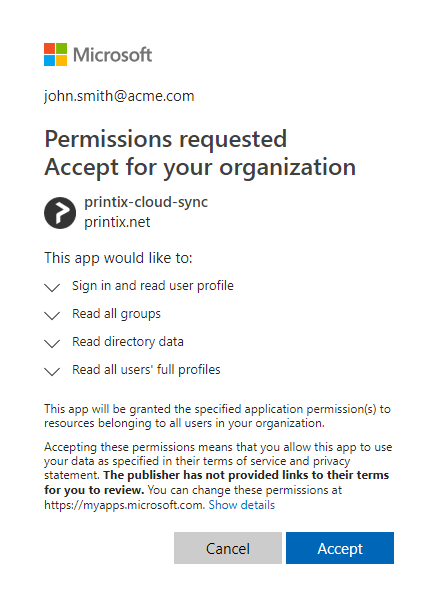 Select Accept to grant these permissions, so Printix can synchronize groups. If this is successful you will see: Groups synchronized from Azure. The account you used to sign in with did not have the role as global admin in Azure AD. RESOLUTION: On the Microsoft Sign in page sign in with an account that has the role as global admin. Only groups added to print queues will appear. RESOLUTION: Add groups to a print queue. RESOLUTION: On the Authentication page select the Azure AD tab. Select the Accept again link to have Groups synchronized from Azure again. On the Azure Active Directory blade, select Enterprise applications. Search for printix should list two applications, namely: Printix and printix-cloud-sync.